Abnormal high blood sugar content in diabetes damages blood vessels throughout the body including the fine capillary vessels in retina. The damage to the blood vessels in the retina prevents it from getting enough blood supply. Diabetic Retinopathy occurs when blood vessels stop feeding the retina properly. As time passes the vessels in the retina begin to leak causing small hemorrhages, swelling, new blood vessel formation (neovascularization) and noticeable loss of vision. In its early stages, when the blood vessels in the retina are damaged, they leak fluid and blood into the retina causing small hemorrhages, swelling which results in a partial loss of vision or a blind spot or blurry or distorted vision throughout the entire visual field. If the swelling takes place in the center of the retina, vision becomes blurry or distorted. This is called “Macular Edema”. In later stages, in an attempt to feed the retina, new fragile blood vessels may grow. Because new blood vessels are weak and hemorrhage easily, they often leak into the retina and vitreous, causing flashes, floaters, spots, and decreased vision. 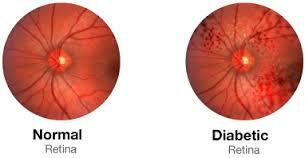 By now, the effect of diabetes on the eye is called “Proliferative diabetic retinopathy”. In the last stages of the disease, abnormal blood vessel growth continues and scar tissue may form causing serious problems such as retinal detachment and resulting in vision loss. Diabetes can have dramatic effects on the eye including glaucoma and cataracts but, the most significant cause of loss of vision can develop over many years as diabetes affects the retina. In cases of retinopathy that are more severe, pregnancy can increase the risk of visual loss. Vision loss from diabetic retinopathy is largely preventable. You can significantly lower your risk by maintaining strict control of your blood sugar, blood pressure, and blood cholesterol, having regular eye exams, and also having an Amsler grid test at home each day. Have regular retina checks. If there are complications they are much more successfully treated if caught early. Diabetic retinopathy can be treated in a variety of ways depending on the stage of disease, specific problems, and the patient. Micro Acupuncture treatment can helps with the blood circulation in the retina and stop bleeding. It can also help to prevent and treat Hyperglycemia, Hypertension, and Hyperlipidemia.